According to the New York Times, Facebook has reached data-sharing partnerships with at least 60 phone and other device makers over the last decade, allowing them to access the data of users’ friends without explicit consent, in violation of the 2011 consent decree of the US Federal Trade Commission. Facebook has insisted that its data sharing is consistent with its privacy policies and the law. Sputnik discussed Facebook's privacy policies with Daniel Wagner is CEO of Country Risk Solutions and author of the book Virtual Terror. Sputnik: What do you make of this? Does Facebook actually violate US laws by allowing device-makers to access users' data? Daniel Wagner: Well, you know, it's not a black and white matter. This is a multifaceted issue. On one hand you have a set of laws that exists, but there isn't much enforcement. On the other hand, the laws are far behind than they should be. And entities like Facebook can basically do what they want because they know it's unlikely they are going to be prosecuted. That's one part of the problem. Another part of the problem is that anything on social media should really be looked at as part of what's known as the "third-party doctrine," which means it's considered a public space with no reasonable expectation of privacy. So, when all of us go on social media we should just presume that at some point in time most everything you do on Facebook or other forms of social media, will become public, one way or another. That's just a fact. Sputnik: But what about 2011 consent decree of the US Federal Trade Commission? Is this not a violation of that? Daniel Wagner: It is, probably, a violation and it is pretty clear, as you just noted that Mr. Zuckerberg probably wasn't completely honest when he said that users have control over who sees their data on Facebook — that is obviously not the case. But remember — we all signed the terms of service to use Facebook and other forms of social media, and they all share information with each other. That's just how it works. So, very few people actually read these terms of service, [to know] that they are signing over permission for these companies to do pretty much whatever they want with it. And knowing that's the case, I don't think there is going to be much of a repercussion at all for Facebook or companies like it. 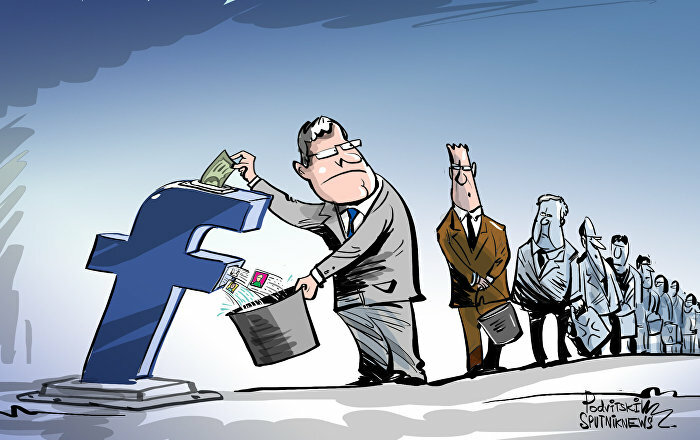 Sputnik: There are people who worked with Facebook back in 2012 and former executive Sandy Parakilas said that the practice of sharing data was flagged back in 2012. What do you make of Facebook's capacity to self-police? Daniel Wagner: I think the simplest way to look at this is that they are more inclined to say "I would like to ask for forgiveness rather than permission." And, you know, public bodies go after them, not NGOs necessarily, because they are doing good job at that already. But until the law-making bodies go after them and really bring down the gavel, I don't think much is going to change. I mean, if you look at Facebook's acquisition of WhatsApp in 2014, when they paid $19 billion for this company, which made very little money, they knew right then and there — what they were after was the data. That's what it is all about. Data is the new oil. That's where the money is. And all of these companies are basically doing the same thing. And you know, in part, we are guilty, because we are willingly giving them this information. When you have Alexa in your home, you are willingly giving them this information. When you allow Amazon to have a new service and go into your home, to deliver the package inside your home and give them the keys to your home, you're giving them that permission. So — we are partly to blame for allowing some of this stuff to happen.